OK….at the suggestion of a couple friends, i am going to share the process of creating a painting. Here, i have posted the beginning of the piece i am now working on, and then a later development of it, as it looks this morning…and i will post another stage of its morphing as i go. I do not yet know where this vision will go, so, for me it is exciting, as are the realms of the unknown, for me. It feels like this painting is seducing me. There is a mystery in it for me. Here is the beginning. 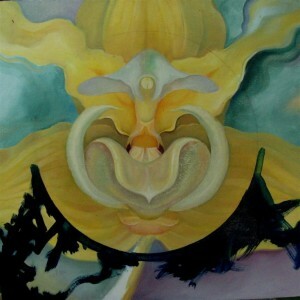 It started with a half finished painting of a portrait of an orchid that i had begun and abandoned, years ago. Lately i had it out….and was looking at it….to see if it had any possibilities. I thought it was quite boring…i was not inspired at all. Orbs: I have had a variety of orbs come into my reality from several sources, both in the past, and lately in a curiously inspiring way. Orbs have also appeared before in my art, here and there. Then, as i pondered the old orchid painting, I began to feel the somewhat “extra-terrestrial-being” quality that orchids sometimes appear to have…and there the vision began! And then i SAW it!! It took on a life! The first image ( above) was as i began to define the perimeters of an orb, super-imposed over the orchid….excited to see where it would take me. An here is how it is developing, now. I feel strongly drawn to this sensuous orb, and the living flow of colors within it…and the haunting forest background that is morphing into existence as well. It feels delightful to be painting this!!! And i will post an update of the next stage of this vision. Off i go to paint!! I watch as you go “further”. I will wait with you to see where this goes! …all about going “further”….we learn about that as on we go in this strange journey of the awakening of spirit/soul. This painting is nearly finished….so the wait will be short. Thank you for your comment. I also think it is wonderful you are sharing the process of this creation on your blog. It is always so interesting to know what was in the mind of the artist before and during the process of seeing a finished painting. Well as you know, orbs are very much in my life too at the moment, and this beautiful one you are creating, with the mystical, mysterious woods behind, is sheer joy for my own imagination..I can’t wait to see it when you add “the magic” although it seems pretty magical to me already..but I know you like to do that, and it is one of your final “rituals” to add it before you can finally put your name on the lower right corner of the canvas. Just a wonderful painting… this sensual orchid alien of an orb.. 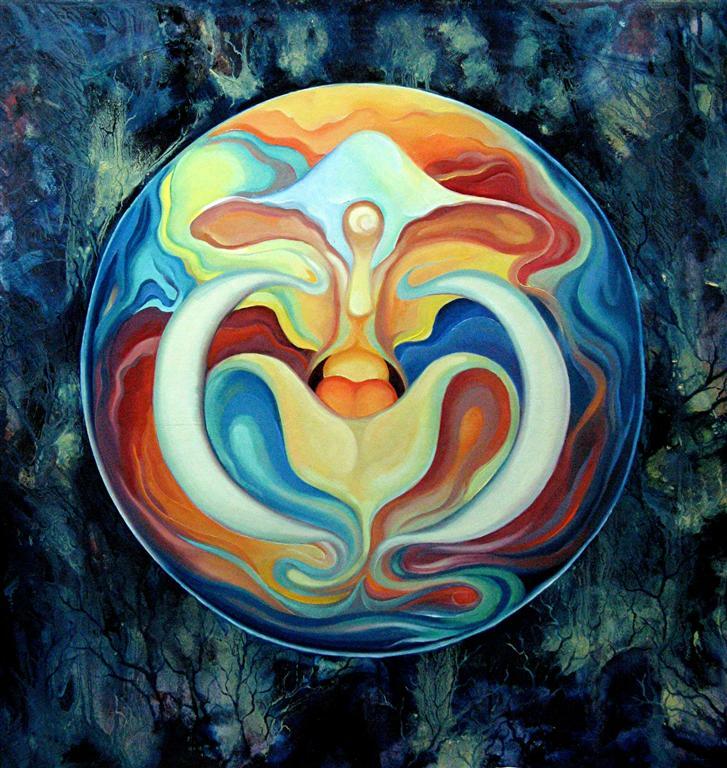 Thank you Karima….yes, for some reason i also really love this painting and how it is manifesting…and your recent writing about your sensual orb from another realm has indeed inspired this strange “sensual orchid alien of an orb” as you put it. I feel a life in this orb!!! Fun!! Amazing to see the two visions side by side, Jan; the first, muted and uncertain; the second, filled with light and life and motion… like a butterfly emerging from a chrysalis. Nothing left to do but fly! Thanks for a peek inside your creative process. Hey Chrome….wow…thank you…i always love your insight! Yes! I hadn’t seen this painting in the way you said “..a butterfly emerging from a chrysalis” ….and now i do and i love the feeling of it! This painting is somewhat of a mystery to me and a delightful surprise…it arrived like a gift. The creative process is so magical…and when the sometimes illusive spark arrives…wow!! Very interesting. I think the less you try to control a new creation and just let it move…it will find its own balance, direction. Energy. The unconscious knows more than we do awake. So it is about simply opening/nudging that door. I see colored energy flowing into it’s opposite or counter. The Yin into Yang…and visa versa. The knowing into the unknown. Comfort into discomfort. The liquid and mercurial balance life seems to offer up at every turn. Death into life. Wet into arrid. But, overall the final take is balance and peace. Much like RL! I see stability and resolve come from all the movement. Resolution coming from unstability.So much movement! Your work is in motion everywhere. But it resolves into quiet and balance. How interesting! It moves like an animal moves…..smoothly with intention. Like a stalking cat. Beautiful work, Jan. You have creation in your thoughts and fingers. Very powerful force. Nice! OH! What a stimulating, inspiring comment!! You are reading this process from a really profound point of View…wow! And yes…as my art flows into a new flavor that is not using the symbologies i previously used…i move into unknown areas of feeling and sensations, movement…and when i get stuck not knowing what to do next to it, i find ego is trying to control, and then i clearly see how it blocks, even when it has the best intentions!….when i release, surrender, the energy flows. This puts fire into one’s art and spiritual path!..”..the less we try and control a new creation, and just let it move…it will find its own balance, direction. : (your words ) Every moment is a new creation! Like the first one, I see a human figure, like the spirit of the flower, this time kneeling, with head bowed, and arms or wings or cape lifting to the sides. Again the figure looks confined and stiff in the yellow version, poised on the threshhold, patiently and formally waiting for permission to fly. The final version is full of vigor and palpable vibration—you can feel the wind flap and the joy of living pulse!! I loved what you had to say….the playfullness and movement of how you see….the recognition of what all this is about.